Keiichi Maebara has just moved to a seemingly peaceful new town. He’s making friends and generally enjoying his life until one day he learns of a grisly murder that took place in the little village. His friends won’t give him any details which only adds to Keiichi’s uneasiness. 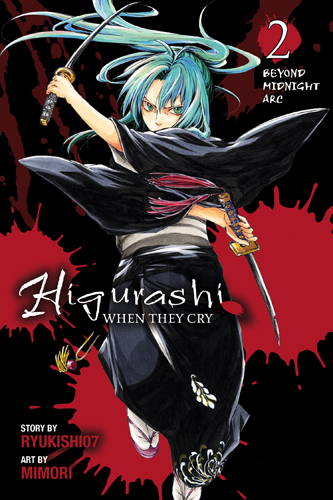 After learning at the town’s annual festival that a death has occurred on that night every year for the past four years, Keiichi is drawn into a web of intrigue to help unravel the mystery of these murders. Things only get more dangerous when he learns that some of his new friends may be involved! 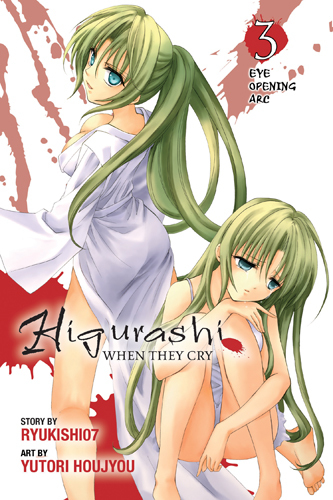 Also look for the independent side story, Higurashi WHEN THEY CRY Demon Exposing Arc! Life couldn’t be better for Keiichi Maebara. Sure, he’s moved to a sleepy, little town where nothing happens and high school consists of a one-room schoolhouse — but his new friends and fellow students are all cute girls!  When he happens upon a story about a grisly local murder, however, his contentment turns to uneasiness as he finds himself drawn into a web of silent intrigue that involves his newfound friends…and threatens his very existence. Up until now, Keiichi’s been having the time of his life with his new friends in Hinamizawa. 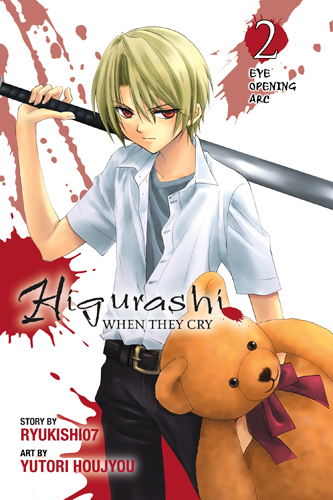 But when their good-natured pranks take a deadly turn, Keiichi grows more and more suspicious about their involvement with the so-called “Oyashiro-sama’s Curse.” Turning to Ooishi-san for reassurance only confirms Keiichi’s worst fears as dark secrets about Rena’s past are revealed. Is it just his imagination? Or do his friends really mean to kill him? Twins Shion and Mion have Keiichi seeing double. But as he grows closer to Shion, their flirty friendship has Mion seeing red. 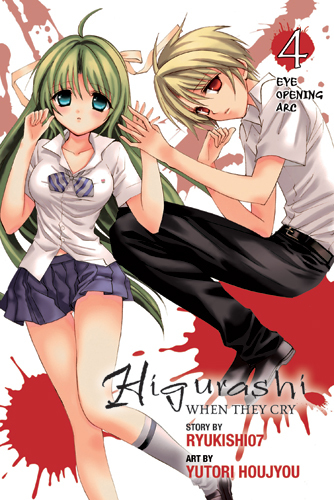 When Shion and Keiichi trespass on sacred ground the night of the Cotton Drifting, a string of gruesome murders and disappearances follow. Are the legends of Oyashiro-sama’s curse true? Is there a demon in Hinamizawa? The dark mysteries of Hinamizawa village unfold anew in the Curse Killing Arc! After a short trip to the city, Keiichi Maebara returns to the small mountain hamlet where he is welcomed with a fresh batch of pranks from Satoko and the rest of his school friends. Satoko may be the youngest of the group, but she always puts on the biggest smile. Who knew her upbeat attitude masked a terrible tragedy — a year ago her older brother, her only family, vanished without a trace. Keiichi’s glad to step in and act as her big brother figure, but he can’t shake the nagging questions about her real brother’s disappearance. Transfer student? Teenage runaway? Or could it be…Oyashiro-sama’s curse? Following a lead on the kidnapping of the construction minister’s grandson, Officers Ooishi and Akasaka spot a secluded outpost station that shows signs of recent traffic. A little poking around brings them face to face with the boy’s abductors, and the criminals aren’t going down without a fight. Once the boy is recovered, the dam project is put on hold, and it seems to be a happy ending for everyone. What could Rika’s warning possibly have been about…? 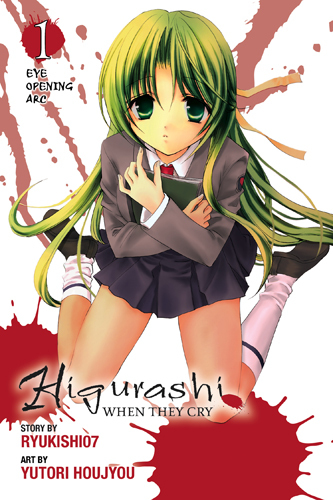 With Mion’s name clearly printed among the names of those killed in Hinamizawa twenty years ago, suspicion for the murder falls on her. But Mion isn’t the only one whose story doesn’t quite add up. How did the killer know Otobe’s was the only phone with a signal? How could Otobe’s friends have simply “disappeared”? Is it really the work of demons, or is there a murderer among them? Unable to provide an alibi for the night of the Cotton Drifting, Satoshi becomes the prime suspect for the murder of his aunt! 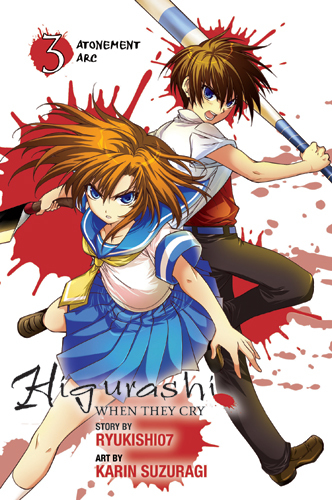 As her friend is hauled away by the police, Shion steps forward as a witness to Satoshi’s whereabouts that night, exposing her true identity in the process. Shion may have saved Satoshi this time, but her actions have put her in serious danger. What will the Sonozaki family do to Shion when they learn of her association with Satoshi Hojo? And what will they do to Satoshi? 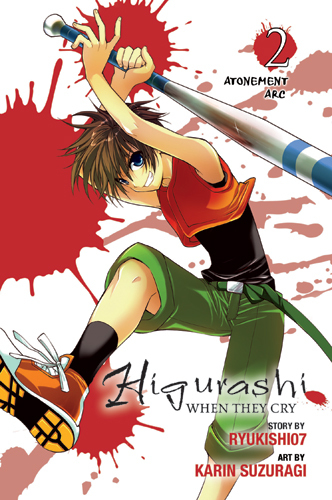 One year after his disappearance, the police are no closer to finding Satoshi or solving his aunt’s murder, and Shion is quickly running out of patience. Dressing alternately as “Shion” and “Mion,” she positions herself as close to Keiichi as possible. Given that he too entered the forbidden Saiguden with this year’s victims, Shion suspects he will be the next to be “demoned away.” Shion hopes her actions will spur on the true murderer, so that when the serial killer does attack Keiichi, she will be ready. The demon of the Sonozaki family has found fertile soil in Shion’s soul, and her fury rages out of control as she targets the last of those who are guilty of paining her beloved Satoshi. But how far is she willing to go? Will any torture or punishment fill the void left by her dear friend? Or will the sacrifices only rip greater holes in the tatters of her heart? The last pieces of the puzzle fall into place in the final volume of the Eye Opening Arc! Rena has taken extreme measures to protect her and her father’s happiness, but such drastic actions have terrible consequences. When her friends learn of her crimes, they feel no revulsion toward Rena, but rather a sense of regret that they hadn’t been able to help her and avert this tragedy. But even if they had sensed Rena’s desperation, would her classmates’ pity have transformed itself from sentiment into action? Hadn’t they had the same opportunity to prevent tragedy a year earlier, when Satoshi Hojo was suffering abuse at home, and failed to prevent his desperate act of murdering his aunt? How much can Rena afford to trust in a place like Hinamizawa? Based on the evidence detailed in Takano’s notebook, Rena believes she’s uncovered the truth behind Oyashiro-sama’s curse and the mysterious deaths in Hinamizawa! But though Rena’s theory fits perfectly with Hinamizawa’s dark history, it is difficult for Keiichi to believe such an outlandish tale, especially given Takano’s fascination with the occult. However, Rena cannot be diverted from her obsession with the plot she believes will inevitably destroy the village. Will her mounting paranoia cause her to take drastic action once again?! Driven out of her mind by the murderous plot exposed in Takano’s scrapbook, Rena is on the run from the police and her friends. When Officer Ooishi confronts Mion about the Sonozaki family’s involvement in the murder conspiracy, Mion reveals a number of other scrapbooks, detailing even more outlandish theories to explain the string of murders in the village. But will this new development be enough to calm down Rena? Or, in her panic, will her next move put all of her classmates in danger?! The “Curse Killing Arc” . . . The “Time Killing Arc” . 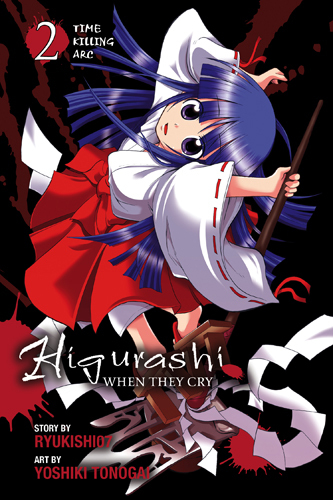 . . As each incarnation of the terrible events in Hinamizawa unfolds, Rika Furude must watch as her friends descend into madness and despair, knowing the only fate that awaits her is death. With the unique ability to see all of these worlds, Rika desperately searches for the common links between them, which will help her break the cycle and give her and her friends a happy future beyond June 1983. But with less than a month before the cotton drifting in her current life, will Rika be able to change destiny in time? Keiichi’s appeals to the Child Consultation Center receive an outpouring of support from his classmates and teachers, but still the authorities refuse to intercede. 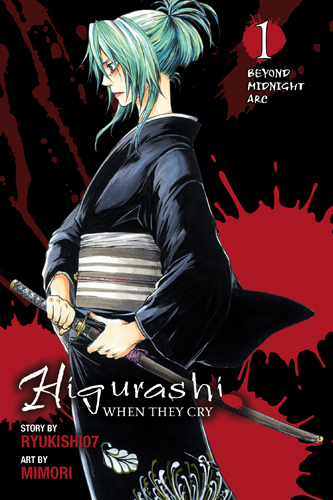 Hinamizawa is a village controlled by three powerful families, and without the support of the Sonozakis—and their fearsome head, Oryou—the Center will not budge. As Keiichi struggles to convince Oryou, Rika feels her dream of living a happy life beyond the summer of 1983 begin to fade away. Does Keiichi have what it takes to make a miracle happen? Can Satoko be saved? Can Rika…? 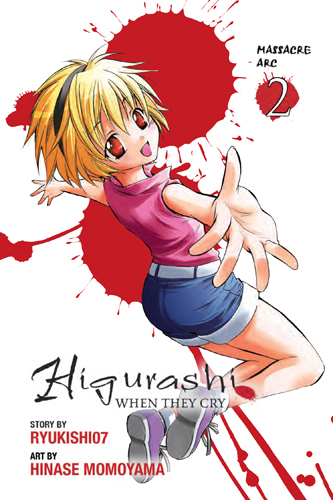 Watching the people of Hinamizawa rally together to liberate her friend Satoko gives Rika hope that she too can defy fate and curb her tragic demise. 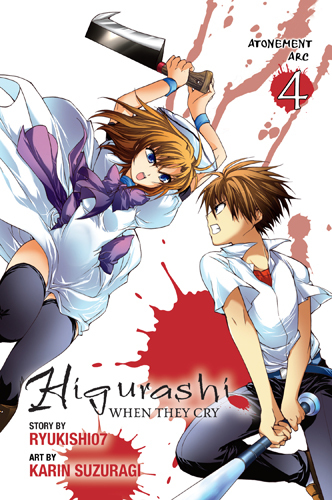 But when the bodies of Takano and Tomitake are discovered, Rika fears her chance is slipping away. 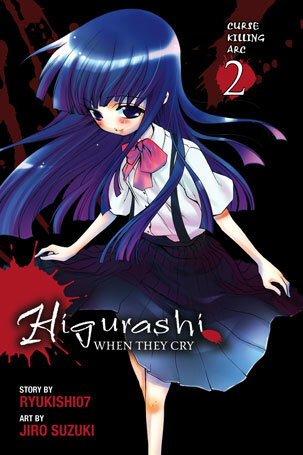 Not knowing who to trust and not wanting to put anyone else in danger, Rika pulls away from her friends. 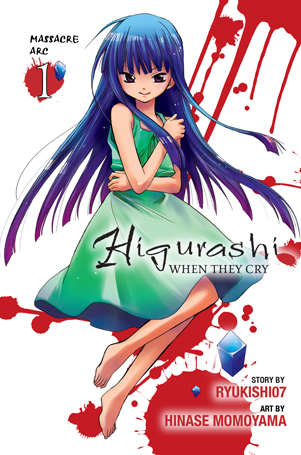 But as her experiences in this world continue to diverge from the norm, Rika clings to the hope that the events that lead to her murder might also change. She has the will to change her destiny, but will that be enough to defeat whoever—or whatever—wants her dead? Through Miyo Takano’s efforts, the research on Hinamizawa Syndrome has won the support her grandfather never received. 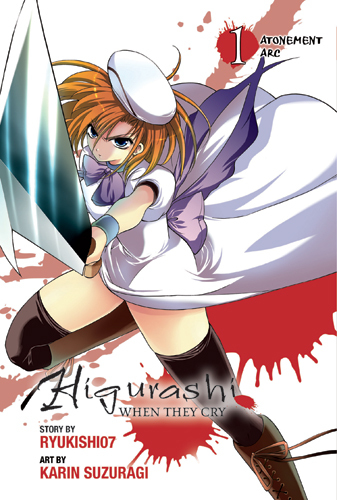 But Dr. Irie has glimpsed the madness that drives Takano to achieve results by any means, and his loyalties are challenged when he is ordered to perform a vivisection on young Satoko Hojo. 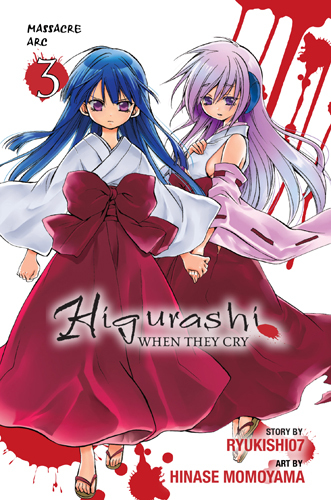 After endless cycles of tragedy, Rika at last finds herself in an incarnation where she knows the true culprit behind her murder. But with only a week before the Cotton Drifting Festival—and her demise—she and Hanyu are going to have to work fast to devise a counter-strategy. The past has shown that Rika can count on her friends for support if she is open with them about her fears. 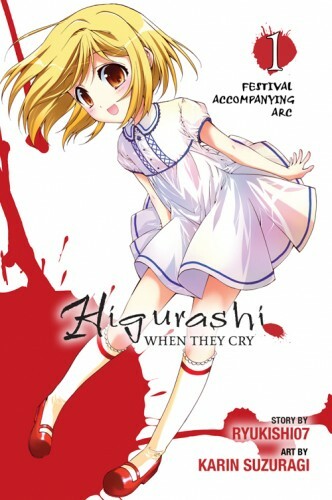 Even so, if she wants to unravel the plot that will ultimately destroy Hinamizawa, she’s going to need help in higher places—but what evidence would convince an adult that the little girl’s fear of death is founded?